When a powerful mutagen that was long-thought to have been lost in a laboratory fire is discovered in the blood of four hulking, anthropomorphic, crime-fighting turtles and their diminutive, anthropmorphic, father figure, Eric Sacks sets forth a plan to retrieve the mutagen and unleash a chemical attack on New York City in order to sell the antidote to the citizens at a huge mark-up. For some reason he needs the help of The Silver Samurai or something. I stopped paying attention. TEENAGE MUTANT NINJA TURTLES is a property that has always held a special place in my heart. It is the first franchise that I can recall actively caring about. So I always think there is a spot for the turtles in pop culture. Heck, I would even go so far as to say it makes total sense for Michael Bay to be producing new big-screen adaptations of the turtles as there aren't too many steps between TRANSFORMERS and TMNT. All that to be said, TEENAGE MUTANT NINJA TURTLES is a borderline act of war from beginning to end. I think the worst part about all of this is that there is kind of a good movie lodged in this premise. Re-read my description paragraph, it actually sounds like it can work. There is also a very cool opening sequence featuring some comic book inspired imagery and hype man narration from Splinter. The fault lies squarely on the shoulders of director Jonathan Liebsman and the army of screenwriters at his disposal. The script forgoes any sort of actual character development or purposeful story propulsion for extended sequences of characters sitting around discussing huge swaths of backstory until the writers arbitrarily pick a spot where the enemies can attack. Rinse and repeat. During the moments where there aren't flashbacks the dialog is horrendous to an offensive degree. April spends most of the movie trying to convince people that the turtles are real while they look at her like she's crazy. This would make sense if it weren't for the fact that after the first of these interactions she ends up with UNDENIABLE, CONCRETE PROOF THAT THE TURTLES EXIST and chooses to show it to the one person who would believe her to begin with. The turtles talk like a mid-40's white guy posed the question "Say, what do those kiddos who come from the streets with a 'z' say?" and another mid-40's white guy said "I'm actually not too sure and it doesn't really matter, but said kids LOVE wearing sunglasses on top of their head at night, so we're making Raphael do that!" 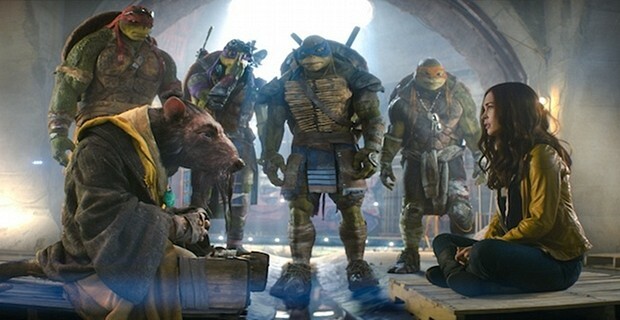 There is no sense of visual storytelling in TEENAGE MUTANT NINJA TURTLES. Anytime information is revealed through the images on screen it seems like an accident that they decided to keep because it looked cool. The film has Battlefield Earth-levels of canted angles at random times and for no other reason than...I honestly have no idea. The action is mostly hidden in shadows and shaky cam save for one truly entertaining set piece down the side of a snow covered mountain that I can only assume came out that way by sheer luck. The CGI on the turtles is servicable, but the character designs are hideous. They look like some unholy creation set forth by an unethical cross breeding of Doomsday from BATMAN V SUPERMAN and the Monstars from SPACE JAM. Splinter fares even worse. He is unsightly and his CGI never meshes with the backgrounds the way the turtles do. Also, all of the pizza in this movie is CGI. I don't even know where to start with that. While we're on the subject of the turtles and their sensei, let's talk about casting. For their parts, Michaelangelo, Donatello, and Raphael are fine. But things get weird when you realize Johnny Knoxville (yes, THAT Johnny Knoxville) is the voice of Leonardo. Sorry, but there's something about an eastern Tennessee accent exiting the face of a 7-foot anthropomorphic turtle trained in the ways of the ninja that just doesn't quite mesh. Once again, Splinter fares even worse in this department as well. For reasons I have not even begun to try to understand, Tony Shalloub was cast in the role of Splinter. Keep in mind, the rat is clad in a gi and rocks healthy Fu Manchu facial hair. Everything about the character's design is rooted in Asian iconography. Annnnnnnnnnnnd they decided the best actor working today to embody that is none other than Monk himself. I hated every second of this movie and have dedicated far too much of my night writing this review so I will leave you with this: sometimes I lean over to people I am watching a movie with and say the stupidest possible thing I can think of to happen in the movie. For instance, during a screening of LEGEND OF THE GUARDIANS: THE OWLS OF GA'HOOLE I leaned over to a friend and said "Wouldn't it be stupid if there was a training montage set to an Owl City song?" and that's exactly what happened. TEENAGE MUTANT NINJA TURTLES ends in a way that is almost a challenge to that very on the nose, very stupid moment in LEGEND OF THE GUARDIANS. The very last thing that happens in TEENAGE MUTANT NINJA TURTLES is the turtles drive off into the night while singing Happy Together. For those not in the know, Happy Together is a song performed by you guessed it, The Turtles. I present that information without commentary. It should be enough for you to decide on what kind of movie you're dealing with here.